Pizza Hut's Middle Eastern restaurants are offering a pizza studded with cheeseburgers and covered with burger toppings, in the chain's most recent — and outlandish — fast food hybrid. And you thought the hot dog crust sounded like overkill. 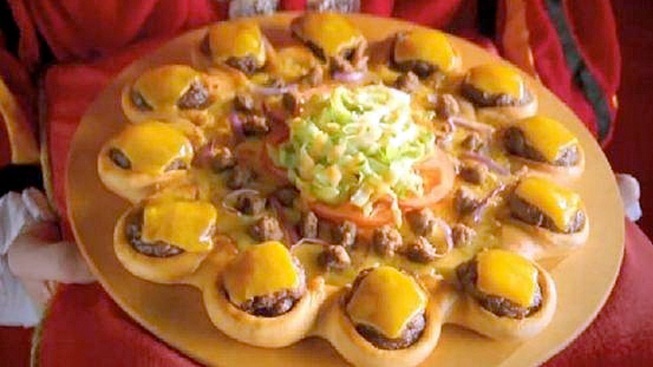 Pizza Hut, which seems never to tire of cramming disparate foodstuffs into its pizza crusts, has launched the most over-the-top yet: A pizza surrounded by cheeseburgers and topped with beef, lettuce and tomatoes. The pizza chain's Middle Eastern outposts are currently the only ones to offer the outlandish crust concoction, which they call the Crown Crust because it sort of resembles a crown, Today's Bites blog reported. Don't eat red meat? That's okay — get the pizza with the chicken nugget-studded crust and barbecue sauce topping instead. Vegetarian? There's always the Cheesy Bites Remix, which has an unlikely combination of Mexican seasoning, cream cheese, mozzarella, parmesan and sesame stuffed into the crust. The new hybrid pizzas seem to be trying to outdo the recent invention of the British arm of Pizza Hut: a pizza with a giant hot dog threaded through the crust.